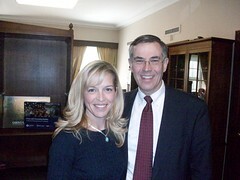 Congressman Rush Holt pushes to reopen the OTA! Tuesday 3/24, the Science Cheerleader met with Congressman Rush Holt (NJ) and his Congressional Fellow Will ONeal to talk about reopening the Office of Technology Assessment (see link below for background) with a greater emphasis on public participation efforts. Congressman Holt (a physicist) is the tireless advocate in Congress who has been pushing for the appropriation of funds to reopen the OTA. On April 3, he will submit a formal request for funds and on May 5 he will argue his case before the full Appropriations Committee. So very refreshing that he “gets” the significance of playing up the public participation aspect. The Executive Branch (Obama) has no shortage of science and engineering advice on policy issues as well as programs to open bidirectional conversations with the public on key policy issues. Why shouldn’t Congress have the same resources available to them? It can be done through one, lean, smart office: the Office of Technology Assessment. I’m hoping he will insert such language in his short request/justification for funds. Stay tuned. He might need our help in garnering more support from particular Congressional members…. Join the OTA Facebook Discussion.